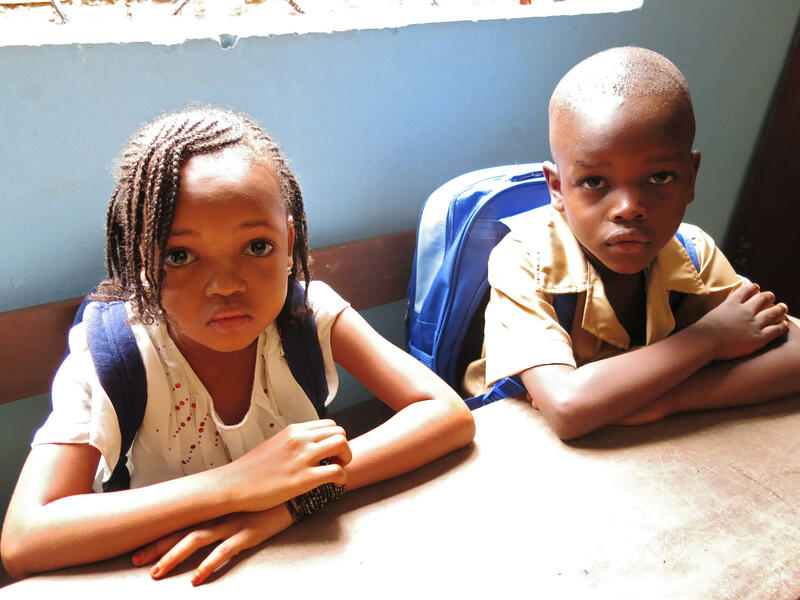 Six-year old Hadja Sow (left) and a classmate on their first day back at school after a prolonged break because of Ebola. "Work, Discipline, Success" is the motto of the Jem-Plus nursery and primary school in Conakry, Guinea's capital. Children and teachers sing the national anthem on Monday morning, their first day in school since July. Sounds like the start of an ordinary school day. It's anything but. Before the kids leave home, mom rubs chlorinated water on their arms and hands — a common precaution against Ebola. Millions of schoolchildren have been away from their books since July in Guinea, where the Ebola outbreak first began more than a year ago. The country's schools reopened Monday morning. 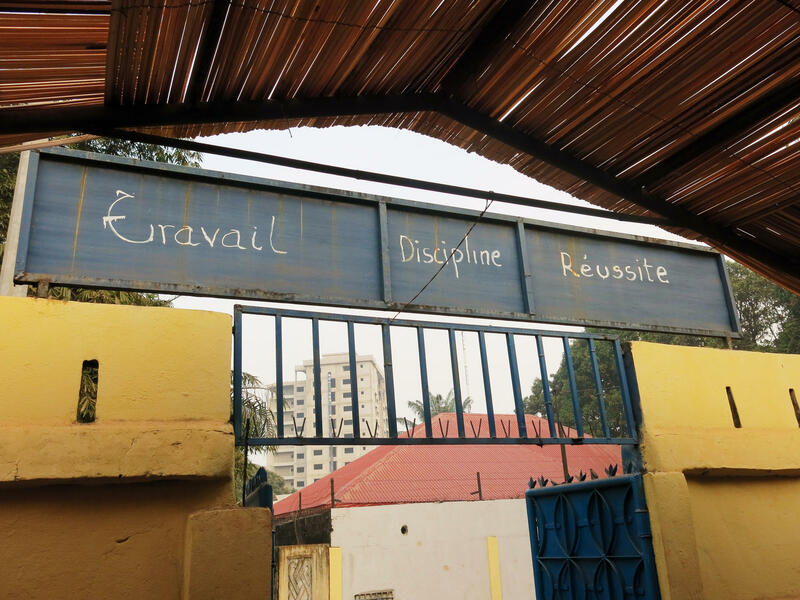 There's a warm welcome from El Hadj Mamadou Aliou Diallo as children approach the entrance to Jem-Plus, a private nursery and primary school. Before stepping in, the kids wash their hands using buckets of diluted bleach water and have their temperature taken with infrared thermometers that can do the job from a distance. These supplies are part of 48,000 "Ebola packs" distributed to schools by Guinea's health and education ministries along with UNICEF and other partners, says Sayo Aoki, coordinator of UNICEF's anti-Ebola efforts in the schools of West Africa. "We are now starting to train teachers in psychosocial support for children, [who] have lived through a very frightening and scary experience during this Ebola outbreak," Aoki adds. "We will do all that is possible to have a very good year," says Diallo, the school's co-founder. "It is our hope." As the kids sing Guinea's national anthem, one of the fathers, Mamadou Bah, watches with an indulgent and satisfied smile. The telecom engineer has brought his two boys back to the school. It wasn't an easy decision, he says, because Ebola is still uppermost in everyone's mind. Some parents are jittery. Almost 2,000 Guineans have died from the virus, including dozens of children. But Bah believes kids must be educated — Ebola or no Ebola. "If I didn't feel at ease," he said, "I wouldn't have brought my kids back to the school." Rushing off to work, Mariam Oulare drops one of her five children at Jem-Plus. She had a moment of hesitation but, like Bah, is confident about the school's anti-Ebola policies. "I'm sort of reassured that the precautions are good here," she says. "So I trust them with my children. I'm happy my kids are back in school." And yet: "You can't help worrying about Ebola." On the other hand, having five kids at home for so long was not easy, she says. Many other parents say they won't send their kids to school just yet. And some of the kids give baleful looks as if they'd rather be home. But most of the children at Jem-Plus are smiling and chatting, glad to be back after months away. Alhassane Sow says it feels good to sit in a classroom again. "I'm really happy," says the 11-year-old. "I like school very much." He still worries about Ebola but adds, "I've come to study hard," echoing the school's motto: "Work, Discipline, Success." Millions of children in the West African nation of Guinea had been out of school since July. Classes were canceled as Ebola spread. Well, today, they went back. The number of Ebola cases has dropped recently, but some parents are still concerned. In the capital, NPR's Ofeibea Quist-Arcton witnessed one family's return to its early morning school routine. OFEIBEA QUIST-ARCTON, BYLINE: The Sows - parents and four children, two girls, two boys - are up early. Aissatou Sow heats up breakfast for the household, including her two youngest - Alhassane, who's 11, and 6-year-old Hadja, who stretches out her arms and hands to be rubbed down with chlorinated water against Ebola. Big bro helps little sis zip up her book bag and it's into dad's car. AISSATOU SOW: All on board. Off to school. OFEIBEA QUIST-ARCTON, BYLINE: Sounds like the start of an ordinary school day - not so. Ebola has kept the Sow children and millions of others away from their books for months in Guinea. The U.N. says Ebola cases are falling. But launching a Zero Ebola in 60 days campaign over the weekend, the prime minister said denial is still a problem. EL HADJ MAMADOU ALIOU DIALLO: You welcome here. This school is the school of Mr. Sow. His children, for many years, are here. QUIST-ARCTON: A warm welcome at a private nursery and primary school in Conakry from co-founder El Hadj Mamadou Aliou Diallo. Children wash their hands with diluted bleach water and have their temperatures taken. All is well, says Diallo. DIALLO: We are happy, no problem. We are happy, and we do all that is possible to have a very good year. It is our hope. UNIDENTIFIED CHILDREN: (Singing in French). QUIST-ARCTON: Faustin Agbaleti conducts a motley crew. Children sing Guinea's national anthem as Mamadou Bah looks on. He's brought his two boys back to the school but says some parents are jittery. Almost 2,000 people in Guinea have died of Ebola, including children. But Bah says kids must be educated - Ebola or no Ebola. QUIST-ARCTON: "If I didn't feel at ease," he says, "I wouldn't have brought my kids back." 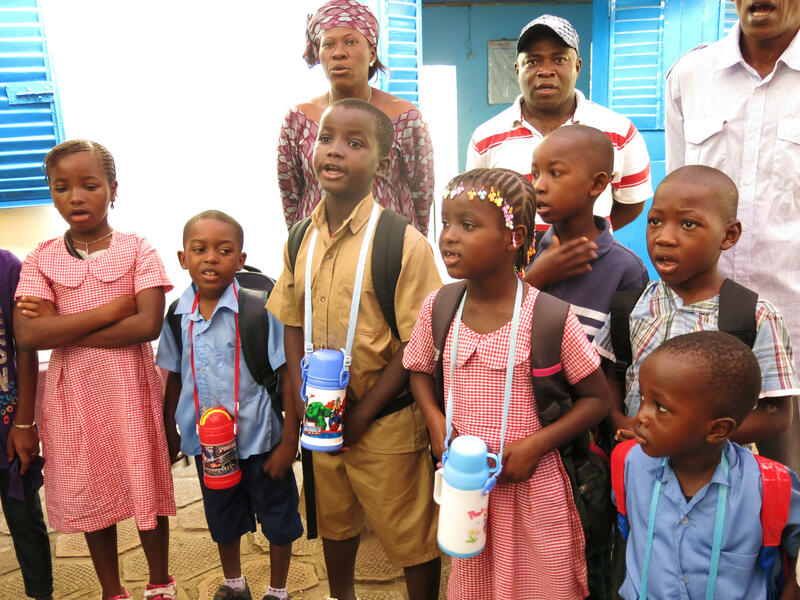 Rushing off to work, Mariam Oulare has dropped off her five children at different schools. She had a moment of hesitation but is giving this school the benefit of the doubt. QUIST-ARCTON: "I'm sort of reassured that the precautions are good here," she says, "So I trust them with my children, but you can't help worrying about Ebola." Most of the pupils look happy to be back after months away, though some gave baleful looks as if they'd like to be at home. Eleven-year-old Alhassane Sow tells me it feels good to sit in a classroom again. QUIST-ARCTON: Alhassane says, "I'm really happy to be back. I like school very much, and I've come to study." Just like their school moto - work, discipline, success. QUIST-ARCTON: Children have returned to class, leaving Guinea's adults to grapple with the Ebola epidemic. Some say the government's plan is overoptimistic - trying to stop the virus in two months - but that the campaign is a first step. Ofeibea Quist-Arcton, NPR News, Conakry. Transcript provided by NPR, Copyright NPR.